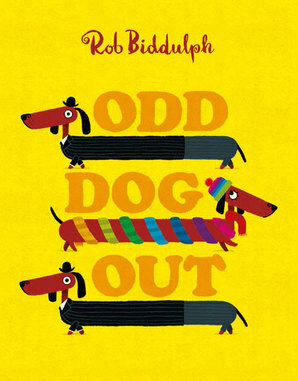 We were very lucky to win a signed copy of Odd Dog Out in a Twitter giveaway (thank you Rob Biddulph!). As big fans of Blown Away we were eager to see Rob’s latest picture book with its eye-catching cover. It’s a really fun story that conveys an important message about being who you are and not trying to be like everybody else. The Story: Odd Dog doesn’t look like any of the other dogs in her town and everything that she does is different. She decides to leave and after a very long journey ends up in Doggywood where she fits right in with everybody else. But then she meets up with another dog who doesn’t and she realises that being different is ok. She rushes back to her town and receives a warm welcome from her friends who start to see things differently too! Odd Dog Out’s striking yellow cover invites you to open the book to enjoy its bold colourful illustrations and fun rhyming story. Odd Dog doesn’t appear on the first spread which shows dogs dressed identically for the office and dogs driving identical cars. We felt sorry for Odd Dog when we first met her, she’s dressed differently, playing a different instrument and not driving a car. But she’s so happy when she first arrives in Doggywood and discovers that she’s just like everybody else. She sympathises with the ‘odd dog’ she meets who has no problem being different but it isn’t just her that learns a lesson about being unique, her absence has also made her friends think and things look very different on the final spread! Rob Biddulph’s simple rhyming text is bouncy and easy to read and his illustrations are a riot of colour. Odd Dog wears a brightly coloured scarf and bobble hat, to reflect her more colourful personality (maybe? ), and (almost!) everybody in Doggywood is wearing the same. However, in our favourite illustration, which covers a whole double spread, Odd Dog changes her outfit to match the season – she made a very long journey to get to Doggywood! The final spread is particularly fun to look at and we’re intrigued by the picture of Odd Dog and her new friend at the end of the book. This is a lovely story which shows children that their uniqueness and own ideas should be celebrated, being just like everybody else is not important. Odd Dog Out is a great story to introduce this concept in an Early Years classroom, its fun rhyming text also makes it a good book for beginner readers. You find such fun books! I want to read this one too. I do like rhyming text for little ones. This is a really easy rhyme to read and a lot of the story is told through the pictures.